Sometimes I long for the days of diapers. For nights when I don't hear "Mom, I have to go potty, can you help me?" For car rides where we don't have to stop every 30 minutes. For plane rides where we don't have to do a Cirque du Soleil balancing act in the tiny bathroom so that M doesn't fall into the blue liquid abyss. Since M was potty trained in January, she has had a handful of accidents. Only once have we had to change the sheets at night. Why? Because the instant this girl feels the urge to peel, she is all "I have to go potty now Mom!" That's great, right? She is in control of her body, and understands the urge to go to the bathroom, and has since we potty trained her. It is great, but it also means that she has no idea how to really hold in her pee, and therefore we have to stop very frequently to use potties. And sometimes she pees less liquid that the condensation under that glass you have next to you. That is fine when we are at home, or close to home, or out shopping - I am used to searching for the closest potty at all times. But when you are in the car, on a long drive (and I mean anywhere that takes an hour plus to get to) it is a hassle to pull of the highway and find a bathroom that doesn't want to make you gag when you enter it. And let's add in another important part of the equation - a sleeping baby. In order to stop and use the potty, you must of course wake aforementioned sleeping baby, because you are a good mom and you don't leave your kids in the car. Enter the Potette Travel Potty. And of course, Val is always a sleep on the drive, and 90% of the time I am by myself (as we usually go down before my husband can bust out of work) so I don't want to wake her up. Instead of looking for a place to pee, I now look for a quite, empty parking lot. I set up the portable potty on the drivers seat, hook one of the little baggies up to the seat and M can do her business without me having to juggle a screaming baby and M in a gross bathroom. 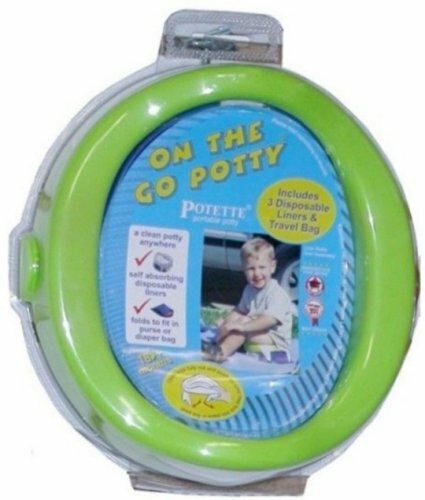 The Potette Potty is so easy to use. Just pull the legs out, snap them into place, put the little baggy on the seat (this catches the pee pee and poops) and then tie up the baggy, toss it and go. I will have to say that it is much easier to use if you set it up in the trunk of an SUV, as the trunk is a flatter surface, but our trunk is usually packed so we use it in the front seat. It came in very handy on our 5 hour trip to the Catskills last month - we could just pull off the highway and park quickly so M could do her business, without having to wait for the next rest stop, or use a sketchy gas station bathroom. It also comes in handy when you go to a park that doesn't have a porta-potty. I am not for "whipping it out" in public, girls or boys - in the privacy of your own home whip it out all the time, but at the park, keep it in your pants kids!